An elegant personalised 8 gigabyte USB drive, in a dark-grey box, containing a space for up to 150 9x6 inch prints, (supplied separately). This heavy-weight material USB Gift Box is the very height of quality and superior craftsmanship. 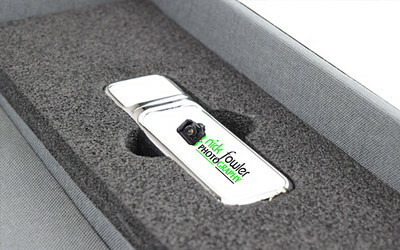 It holds a CD or DVD, (optional) a USB and up to 150 9x6 inch photographs, which are easily removed by the short ribbon enabling you to lift the photos at an angle. To the side of that, a hard foam die-cut holds the faux leather 8GB USB in place. Please get in touch to check availability & inquire about our wedding photography packages.